In the making of our city guide, we rounded up some of our favorite restaurants, shops, and spaces in our home city of Philadelphia. We also sat with some of our like-minded friends and collaborators and talked shop. 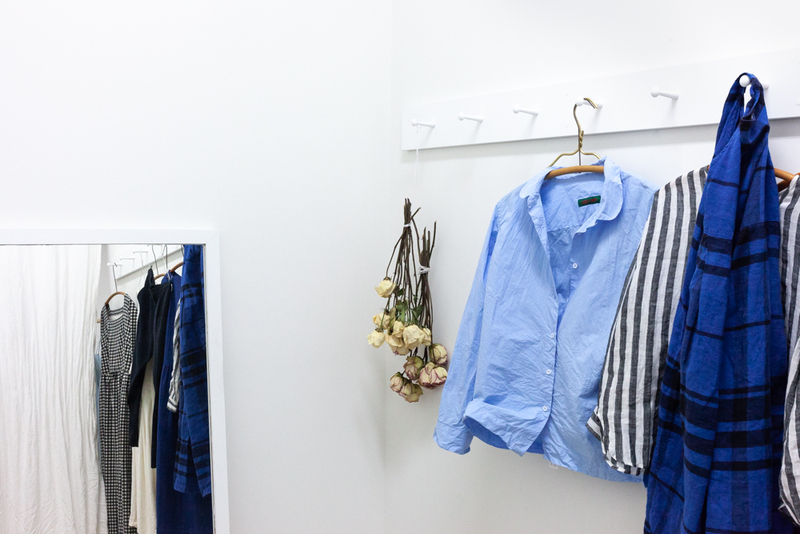 Here, we catch up with Julia Okun, designer and owner of shop and atelier rennes. It is a rare thing, in today’s predictable retail landscape, to come across a shop that strikes wonder in the hearts of jaded shoppers. 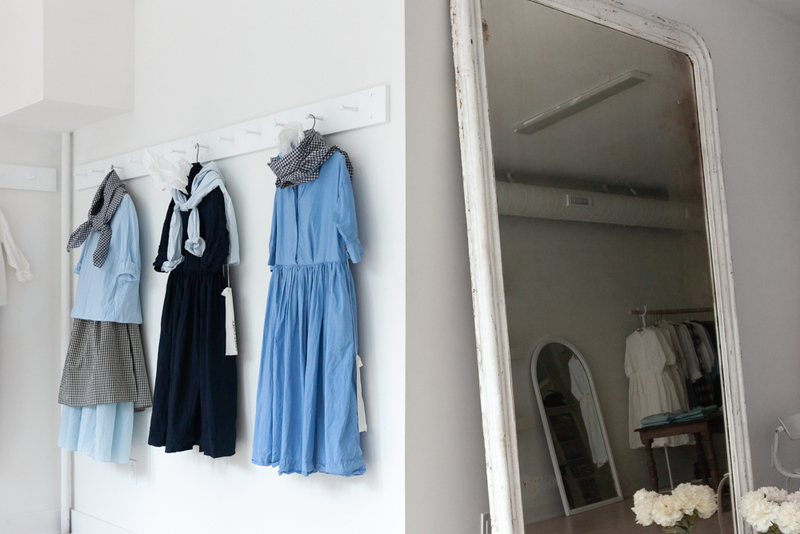 One such shop is rennes, a boutique and atelier nestled in a sunny space in Old City, Philadelphia. rennes is a treasure trove of gingham and organza. Their voluminous dresses and simple shifts blend romanticism with practicality. 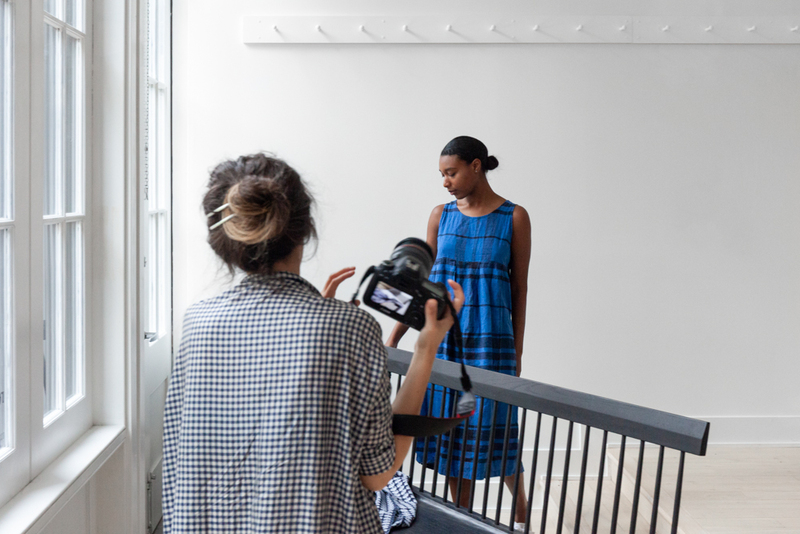 The brand’s ethos is intimately connected to the values of its owner, designer and Boston transplant Julia Okun. An advocate for small businesses and a vocal critic of fast fashion and consumerist culture, Julia built rennes from an Etsy shop selling handmade leather handbags into a sun-drenched shop that recalls the storied city ateliers of years past. The brand carries many exclusive and hard-to-find labels and owes much of its character to craft traditions that uphold care and longevity over trends and bargain counters. It was this interest in natural fabrics and the manufacturing process that inspired Julia to begin her own label. Here, she tells us how it happened. Julia looking at home in her spacious studio. "Something like this" is hard to describe, and Julia, like most artists, is understandably hesitant to define her shop’s aesthetic. “I’ve never encountered a word that gives a name for this style,” she admits when we ask her to describe rennes’ aesthetic. “Maybe billowy shapes that aren’t totally skintight. Lots of layering. I felt like I didn’t see that here [before], and I remembered it looking so good when I went to Japan. I do feel like there’s a common theme of natural fabrics. It's slightly romantic with some historical references in there, but there’s not a specific story.” That vagueness lends itself well to a creative customer: when you can’t define something, you can’t limit it. The rennes aesthetic is so skillfully executed that you would think it would attract a very specific kind of personality- to the degree to which, if you took it upon yourself to round up all the rennes customers and place them all alongside one another, you'd probably expect them to all dress the same. In fact, the opposite is true and you can see the proof when you browse rennes’s website: though the women that model her clothes all wear similar versions of shifts, each model looks uniquely herself. Rennes’ billowy garments, which allow for the movements and the gestures Julia so loves, thus become a tribute to the art of wearing clothes. “I want you to wear the clothing, not the clothing to wear you,” says Julia simply. “Sometimes I’ll see clothes around the city that show midriffs or a tie here, or zippers, and find that I’m looking at that instead of the person.” In a world that seems obsessed with fitting women into predetermined boxes, the rennes model says much by doing very little. Christie, modeling our Denim Hat and Kurume Kasuri Scarf in Bunjin Black, alongside an Ichi dress from rennes's spring collection. As a city grows, it inevitably begins to attract a certain amount of attention from the outside world. Over the past few years, Philadelphia, in particular, has experienced quick growth over the past ten years that has attracted an onslaught of chains and big-box stores that appeal to our wallets while polluting our ecosystems. The decline of small shops is a very real threat that not only threatens the livelihood of shop owners but the quality of life of the city. In a rapidly globalizing world, it's independent businesses that make a city unique. If small shops cannot set the tone of the local shopping culture, if people are taking their cues from the crowded sales racks at chain stores or set their calendars to the tune of their next AmazonPrime delivery, then, eventually, people won’t know how to shop. An uneducated customer may not be able to tell the difference between low-quality and excellent fabrics, from short-lived trends and classics worth investing in, from their own personal taste to a trend prescribed by an algorithm. The power of independent boutiques is that they train people to find autonomy over their purchasing decisions: to develop an eye, to discover their personal style, to demand more quality from their clothes, their possessions, and their lifestyles. Rennes goes one step further and gives their customers a taste of consumer literacy. Every piece is an education in the art of dress-making, and to walk through her shop is to come away with an appreciation for the artistry of the human hand. The prices are not cheap, but that’s because sustainable, ethical work is not cheap. To reduce their price seems somehow wrong because it would erase the hours of human effort that went into making each piece. An outspoken advocate for slow fashion and the importance of shopping local, Julia is vocal about the struggle of succeeding in a consumerist climate. "In my early 20s I shopped and bought so much stuff in the $50-150 range and it all fell apart or I didn't like it 4 months later - it was a bad cover version of what I actually wanted," she writes in a blog post. "I could never justify actually buying the $400 sweater I wanted because it seemed "frivolous" but you know what? It's the opposite of frivolous, it's responsible and better for the environment, economy, and pretty much everything." Julia teaching us about good stitchwork. Rennes is a city in France, but… see, you shouldn’t name things when you’re, like, twenty. At the time I was in school and I was playing with the name Rennes-le-château. I was reading a book about the holy grail and a lot of it took place there, so I thought it would be a cool name for something. That’s what I called my Etsy shop at first, then shortened it to “rennes”. At the same time I don’t think there’s a particularly French aesthetic I’m going for- it was really more of a happy accident. I’ve actually been playing with the idea of an offshoot clothing thing. I would want to, maybe, call it “Nemo” because I really like 20,000 Leagues Under the Sea. It’s one of my favorite books. I really liked his character but I’m also a big Latin person, and in Latin “nemo” means “I’m nobody”. I like that idea of anonymity, that clothing should feel anonymous and not so form-like. That was kind of an idea. I don’t have a large closet at home, because we live in a studio and share a closet. I’ve gotten rid of a lot of stuff. I think I had more stuff in college and when I was younger. I think when you’re young you’re seduced by sales and prices, and then I realized that that was not for me. I feel so much better when I have just a few things. I’m gonna have to give my shout out to Frieda just because I think they’re doing something really different involving older generations of people. I’ve never seen that anywhere else, and I think it’s amazing! I really appreciate having a community of ages around because I think that brings a strong set of values to your life. And their food is really good! They have a good afternoon tea on Sundays. As far as local brands go, Philly has a strong creative community and people are open to talking to other creatives about their projects. Since there are two people working here, we see first hand what our community has to offer. I have a few things from some friends I’ve met since opening the store, and that’s just from them walking into the store, talking about what they’re doing, and moving forward. I don’t think that would have happened in Boston, because people are a little more introverted there. Maybe due to the weather, I don’t know *laughs*. I love this building and this space, but I would love to turn this into a co-op space. I love the department stores in Japan, I love that there’s multiple stores inside of one bigger store. It would be nice to co-own a building with other like-minded people. There could be a cafe, a furniture store, antiques… to have that intermingle into one fluid story would be great. I would like for it to have that community aspect. I like the idea of sharing and rotating the hours, co-owning a building and sharing that responsibility. Thanks to Julia for talking with us and sharing her studio! Find her shop and many more on our city guide, available for pick up at Rikumo and at rennes (or read it in its entirety at the link below! ).